C A Electrical & Building Services - Electrician based in Stockton-on-Tees, Cleveland. 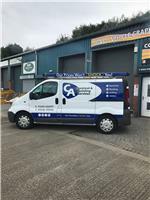 Welcome to C A Electrical & Building Services’ Checkatrade page. Covering the whole of Teesside with over 18 years’ experience here at C A Electrical & Building Services we pride ourselves on offering a friendly, reliable and trusting service to all of our customers. ELECSA Part – P accredited & fully insured, we also provide a guarantee for all work carried out.